1000kms ❖ 23 Cols ❖ 25,000m ❖ 7 nights/8 Days❖ From 2298€ pp. Our biggest trip. The highest climbs. The longest days. The largest rewards. We have a eight day (trip length is up for discussion) cycling trip of a lifetime waiting for you. This ride is not for the faint of heart. Totals come in at just under 1000kms during the week so it’s already very BIG. Your cumulative ascent is 25,000m and you ride over 23 Cols in France, Switzerland and Italy. You finish by riding all three sides of the Stelvio. YES, it’s a big week. Just to name a few of the Cols: Jambaz, Ramaz, Grosse Scheidegg, Nufenen, Grimsel, Furka, Gotthard, Splugen and Bernina. Cat got your tongue? This trip also has four languages in three countries so no wonder. Like we said it’s a ride of a lifetime. This trip is for experienced cyclists as you may have already guessed, and it is fully van supported of course. You should be comfortable climbing +4000m on a daily basis for over a week. This type of trip is neigh impossible for most tour operators, except TTT. If you see something that you would like to do in the rides below, give us a call and we can create your own “Epic Alps Light” trip (shorter and or easier) suited to you and your group’s ability and desires. We can also stretch the big trip to over ten or more days if you wish. Conversely, you drive the support van and we ride. Ride Difficulty 11/10: This week can be described as tough, very tough. No kidding. The average daily distance is 155kms and 4,000m per day of climbing. The easiest day is three Cols, 2922m over 137kms. During the week, 14 of the 18 Cols that you climb are all over 2000m elevation. Day 1: Arrival at Geneva (GVA) Airport where TTT meets you and transports your group to Thonon, France, 45 minutes away. Day 2: We leave Thonon on quiet roads heading south to your warm-up climbs over the Col de Feu and Jambaz. Warm up climbs done, now we attack the Col de Ramaz, then ride up to Avoriaz and finish with the Col du Corbier. We arrive in Chatel, France for a welcome rest, shower and a beer. 5 Cols, 147kms, 4146m ... and that, is only your first day. Day 3: Today we ride to Aeschi bei Spiez in the region of Berner Oberland. This is by far the easiest day of the week with Morgins Pass, Col de la Croix and Col du Pilon on tap. The language changes from French to Swiss German. Day 4: Toughest ride of the week. We start the day with a gentle climb to Grindelwald then take on the single lane and steep Grosse Scheidegg, so narrow that vehicles are denied access. However, the Swiss being the Swiss allow a PostBus to drive the road every hour. Descend down to Innertkirchen and ride up the long North ramp of the Grimsel Pass. Descend the South side of the Grimsel to the base of the Nufenen Pass. The Nufenen is the highest road pass entirely in Switzerland (2478m). 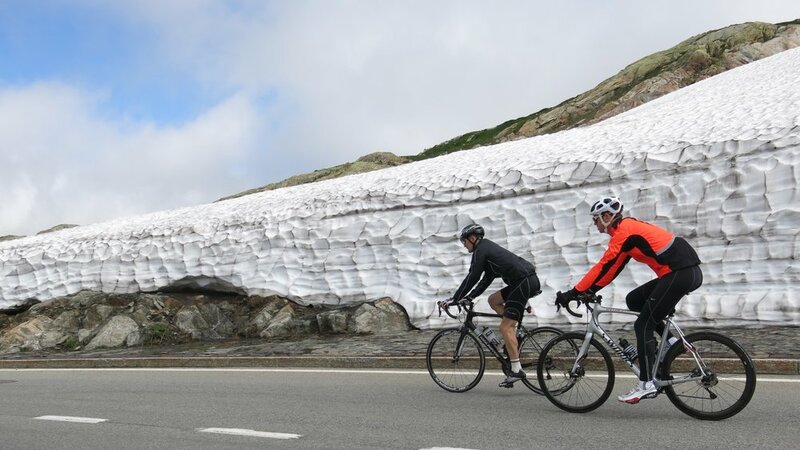 Ride down into Italian speaking Airolo and start climbing the King of all climbs in Switzerland; the Tremola. The top of the Tremola is actually at the Gotthard summit which is mercifully close to your hotel in Andermatt. Val di Tremola (Tremolsstrasse). An iconic cobbled road, completed in 1832 and re-constructed in the mid 1900's. The road has 24 named switchbacks and is considered to be Switzerland's longest historical monument. Day 5: A quick little Andermatt loop with four Cols. The Furka, Grimsel and the Susten Passes. An absolute iconic loop ride! But the day is not over yet. You climb the once impassible Gotthard on the North ramp and descend 81k! down to Italian speaking Bellinzona, Switzerland. Day 6: Another tough day, because 70 kms, or 42% of today's ride, is above 1800m. You will feel this later. We start with the unknown, yet amazing Splugen Pass with its stacked switchbacks, then the Majola, Bernina and Forcola Passes. The ride ends in beautiful Bormio, Italy at the foot of the Stelvio. Day 7: Last chance to make your mark. One, two or all three sides of the Stelvio? We ride from Bormio to the Stelvio summit (2757m) then ride down the “Engineers Road" to Prato, Italy where you basically have lunch, make a U-turn and climb back up. Once at the top you can take the third option down to Santa Maria in Switzerland for yet another language (Romansch, spoken by 0.9% of the Swiss people), another U-turn and another climb back up to the Umbrail summit and continue the 3.1k to the Stelvio summit for the third and final time today. Day 8: Transfer day from Bormio to Milano Airports. 8am departure.